Where I can tell stories, relate experiences and pass along tips discovered while doing research on my family; through volunteer activities, including as an Online Parish Clerk; and from projects completed as a genealogical consultant. 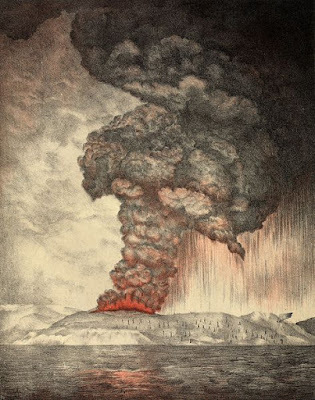 Read my recent article about natural phenomena and family history, in this case coastal margins, in the latest, April 2019 issue of Discover Your Ancestors periodical. In it you will learn about new lands were created along an major estuary in East Yorkshire, England, on which several families established farms. The title of the article is Changing landscapes. You can subscribe to the publication directly here. We hear a lot these days, thanks to TV and the Internet, about major natural disasters. Each one is portrayed as the “worst” or “biggest” or “most deadly” event ever to have been experienced. Most often the comments come from those who were closest to where the events occurred. The sentiments are, of course, subjective, based on a limited level of knowledge of natural history and a result of the anxiety of how people are so negatively impacted. The worst and, to humans, deadliest natural events span history. Contrary to modern news reports, they are not confined to recent years or decades or to any particular region. 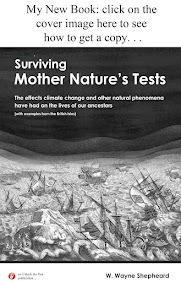 Read about some examples on my latest post at Mother Nature’s Tests. Few people write letters anymore, or even send real cards through the mail, with or without notes in them about what is happening in their lives. Yes, we have Facebook, and Messenger, and Twitter, and WeChat. You can save the messages of course, in some file on your computer or stored in the cloud. I have written about letters in previous posts here. One was about the letters my aunt wrote, in the 1960s to 80s, concerning the family history research she was doing. They also contained news about her family or anecdotes she had heard about various ancestors. Another post was about letters written by various family members in the late 1800s. They were very newsy and well-illustrated the personalities of the senders. Christmas, birthday and other cards often contained letters. I had another post earlier this year about the file box full of Christmas (and other) cards we have sent, received or given to each other over the years. Listening to a 2019 Rootstech presentation the other day about recording stories – by genealogist, podcaster and blogger Amy Johnson Crow – Why and How to Put Yourself into Your Family History reminded me that, in addition to the box full of cards, I have a file folder with letters, mostly to me and my family, from relatives that go back many years. 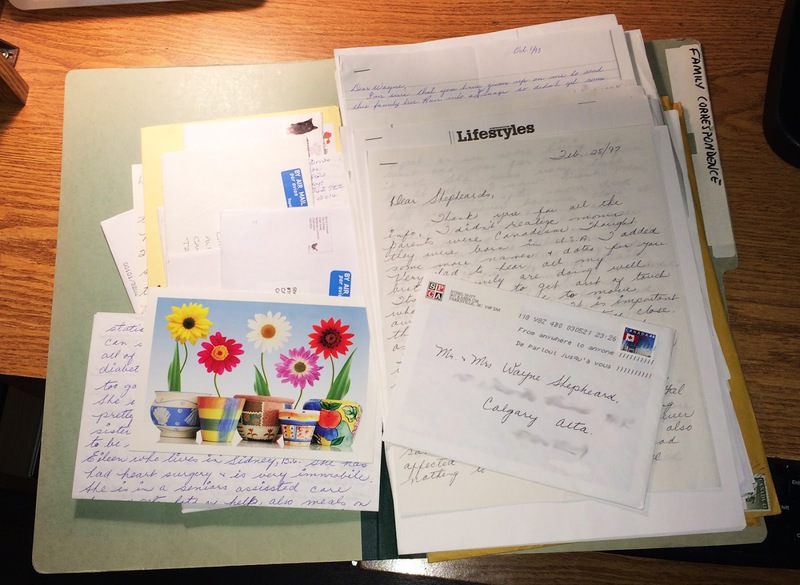 Denise Levenick has also written and spoken regularly on preserving correspondence on her blog, The Family Curator. This correspondence is unique, not the mass mailings of annual news letters that came with Christmas cards (now mostly delivered by email and filed on my computer hard drive). Anyway, I thought maybe it was time to organize the material in the folder, rather than keep it saved haphazardly, as you can see in the photo here. Don’t want my kids to think it is just a junk folder and toss it when we are gone. There is a variety of material in the folder: letters, of course, from family members located around the world; cards with personal notes; cards and letters with photos, most of which have been put into the family albums; notes and letters attached to family information forms which I sent out in 1992 looking for up-to-date data for my family file; and copies of magazine and newspaper articles about family members. My 84-year old Aunt Ethel – my dad’s sister – has been the most generous and consistent contributor of letters. She puts us all to shame in terms of correspondence activity. In recent years, though, even she has succumbed to email, Facebook and instant messaging, to keep in touch with her large family: four children, 11 grandchildren and 15 (at last count) great-grandchildren. Social media is a burden all of us older people have to carry, it seems (just kidding!). Many of the cards and letters were sent by relatives I have known all my life; some were sent by family members I only recently met or came-in-contact with. All of them have information about their families which adds to my own family history. The cards do more than just wish a happy holiday or birthday; they contain the latest news of the families of those who posted them, so have become part of the family record. The first step was to sort the individual pieces by date. That was not always straight-forward. Letters mostly are dated on the day they were written; cards often are not. Postmarks on the envelopes can also be a challenge, especially if they are smudged. In the absence of any dates, reading the notes helped if they mentioned people, events or activities. Once dated, the easiest part was to put the individual cards, notes and letters into their own page protector sleeve and insert them into a tree-ring binder in chronological order. After all the procrastinating, it did not take long to get the material in order. It has been a bit of a blast re-reading some of the old letters as I went along. That’s one of the benefits to organizing things. Wonderful to hear again about the family lives and adventures, especially of those who are no longer with us! Maybe people should take a few hours, every once-in-a-while, to “go back in time” and get reacquainted with family news as it was told by those who lived it. The binder will be on my book shelf now, with all the other family information, for future reference and checking of facts. 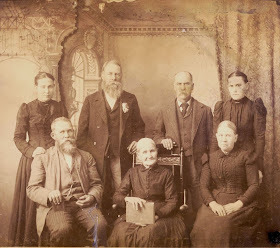 The photo in the background of this website is of the Miller-Watson Family, taken in Manhattan, Kansas, USA, around 1886. My great-grandfather, Isaac Mayfield Miller, is in the back row, second from the right. My 2nd great-grandmother, Hannah Tunstal (Mayfield) Miller-Watson, is seated front-centre. The other individuals are all of Hannah's other children from both of her marriages.